HomeHome, Garden & Tools55% T&Z Stainless Steel Kitchen Sink Strainer, Great Size With Large Wide Rim 4.5”Diameter, 2PC Great For Kitchen Sink. Only $5.85! MATERIAL: Made of stainless steel. More durable than plastic one. EFFECTIVELY TOOLS: Efficient anti-clogging shield lets liquid flow seamlessly into the drain while it blocks food particles. GREAT SIZE: Large Wide Rim 4.5" Diameter,fit for 2.9" sink drains or above.2mm dia holes. EASY WASHED: Easy wash with warm soapy water to keep the mirror finish shine impeccable over time. Dishwasher safe. 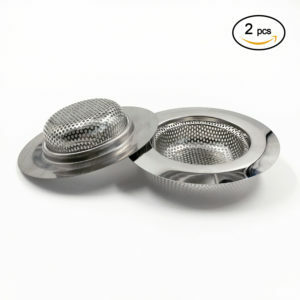 GREAR GIFT FOR YOU: We take pride in the high quality of our Sink Strainer, which has been manufactured with top quality materials. This is totally risk-free buy; CLICK the OXrange button to Order Now! Specification: 55% T&Z Stainless Steel Kitchen Sink Strainer, Great Size With Large Wide Rim 4.5”Diameter, 2PC Great For Kitchen Sink. Only $5.85!